In this edition of What’s your fancy?, I need help choosing which photo is the best of a cute yellow butterfly I met in West Chester. In the last What’s your fancy?, the decision came down to color. Now, I’m throwing in a new style to make your decision a bit more difficult. I took this shot with my Nikon D3100 and a Tamron 70mm-300mm lens. I used the “sport” feature on my camera to shoot with a high shutter speed. The shutter speed was 1/2000. The ISO was set at 400 and the aperture value was at 7.1. This photo was taken at the Voice of America park in West Chester, Ohio. I used two different editing styles. The first was the same as the last What’s your fancy?. As you remember, this editing consists of two steps. First, I use Photoshop to enhance the color and the lighting. Then, I used a program called FX Photo Studio to strip color and leave only one specific color. (Except for the original shot.) In the second, or new, style, I simply used Photoshop to create an Oil Painting feel. Hard to choose but I’m going for Yellow Only. 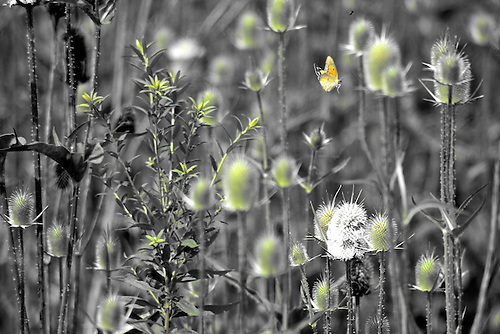 Butterflies … so hard to catch … I love the “yellow only” – I have found a program called … Photodirector – that I will play around with now. The other day I was out walking and it was butterflies everywhere, think I tired 50 shots and manage to maybe get one that is okay. Yes, they are hard to get. I followed one for a long time. It had just beautiful wings.. I could only get it closed up, perched on a plant.. Glad you found a program. Hope you like it. Thanks … it’s a bit fancy .. have to get use to it and look into when I can really do. So many choices, I think I like the “butterfly only” the best. It really draws your eyes to the butterfly. I really like the oil version, guess I’d pick that one, tho the others are also awesome looking. This time I think I prefer yellow only. It has a way in which it made the butterfly to stand out. I like the Yellow only. If the butterfly is the subject, it gives him/her the best stage while connecting the subject to the surroundings. Love the oil paint effect but the butterfly is not as noticeable. I’m partial to the greens and purples so boringly prefer the original. Butterfly only! Was hard to choose! I like the contrast of the yellow and purple in the original photo but I like the butterfly only photo because it highlights the delicacy of the butterfly. They are all lovely, but that yellow only seems to catch my eye. I like the oil painting version. I like the original with all the colour, Lovely images. Butterfly only. Was a tough choice 🙂 Really nicely captured Seth! It’s all about the butterfly. First of all i love your blog… It’s whimsical, it’s interesting, and it’ß interactive. I love color so i’m for the original of that butterfly. The butterfly only one is very dramatic. I like that one. I choose the original! It is so vibrant and fanciful. I could almost smell the flowers! Butterfly only for me. My eye had trouble locating him with all of the other colors. They are all beautiful, if I had to chose, I’d choose, Only Yellow. The butterfly really pops in the second shot but I really like the colors and overall image of the first one. These are all cool looking, but I have to say I like the original best – the green is so vibrant and compliments the purple and yellow so well. Like, three of my favorite colors to go together. The colors also seem to make the textures pop more. The textures are really great in this…thanks for sharing! It’s a close tie for me between the original shot and the yellow only shot. All are beautiful. The oil painting treatment appeals to me as well. Beautiful job!